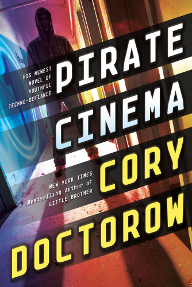 Cory Doctorow lets you download his novels for free, right off his website. Which is how I read his last novel, For the Win–which I also highly recommend. So when I saw his newest young adult novel, Pirate Cinema, in hardcover, I bought it. I set down to read it, and was blown away. Most of what I loved about it falls into the realm of spoilers, but I’ll leave those out. The book takes place in a near-future London only the tiniest bit more dystopian than what we have now, and it’s about a young runaway who finds camaraderie, love, dumpster-diving, and meaningful ways to apply his talents to direct action social change. Cory Doctorow has an amazing talent for making socially-useful fiction. And in this case, he’s written an immersive book that shows quite clearly the ways that legal and illegal activism work hand-in-hand. Of course, I personally found the direct action campaign more entertaining than the lobbying, but that’s how I feel in real life as well. I’ve always known Cory to be a fellow-traveler to the anarchists, but we’re also given a bit of the limelight here: one of the central characters of the book works at Dancing Emma’s, an anarchist bookstore named after Emma Goldman (and, well, named after the real Red Emma’s in Baltimore). It’s not an anarchist novel, but it’s a novel that realistically portrays us as essential elements in social struggle. And while the book takes the point of view of a straight male, it subverts the protagonist’s dominance, showing how he learns to be part of a team. I found the women characters to be strong and central to the story, and the way the book presented homosexuality to its young readers to be admirable. But it’s also just an engaging book, a “stay up till 4am to finish it” kind of book. And a book I highly recommend. I really enjoy Doctorow’s stories – and the semi-hidden how-tos – in his novels. While he is not an anarchist (he believes in a strong state provided social safety net but is clearly a techo-libertarian) he at seems anarchist-friendly (even to Agorists like myself). I had the distinct pleasure of interviewing him for my old podcast when “Little Brother” came out and have been a fan ever sense.